Intensity correlation in quantum optics has been recognized as a fundamental tool to identify the wide class of optical beams from chaotic light to quantum states of light. An electronic analog of intensity correlation can be performed by measuring cross-correlation between two electrical currents. Negative correlations have been observed in electronic Hanbury Brown and Twiss experiments, where partitioning events of uncorrelated electrons generate current noise. Positive correlations emerge for non-trivial entangled electron pairs, as well as for chaotic electron ensembles with low-frequency charge fluctuations. In this way, the noise correlation should be useful in characterizing current-carrying states. One of the key elements in such experiments is an electronic beam splitter that separates one or two input beams into two output beams whose correlation is to be investigated. There is a fundamental difference between optical and electronic beams. While optical beams have definite zero chemical potential, electronic beams may have different chemical potentials, which we address in this work. We find that noise is most sensitive to the non-equilibrium state when the two chemical potentials are adjusted to be equal. (a) A schematic measurement setup. Edge channels and their chiralities are shown by lines with arrowheads. (b) The initial energy distribution function, where Tinj is transmission probability of the injector QPC. (c) The target energy distribution. The non-equilibrium charge measured from eVC (the hatched area) contributes the noise S12. Taken from J. Phys. Cond. Matter. : 29 225302 © IOP Publishing 2017. The particular focus in this work is energy relaxation in a quantum Hall (QH) edge channel. Owing to the chirality of the edge channels, input and output channels for the beam splitter are spatially separated from each other, so that one can design cross-correlation measurement with the capability of tuning the chemical potentials of the input channels. We investigate energy relaxation in a QH edge channel by evaluating cross-correlation current noise S12 = 2 <ΔI1ΔI2> in a series connection of two quantum point contacts (QPCs), as shown in the figure. 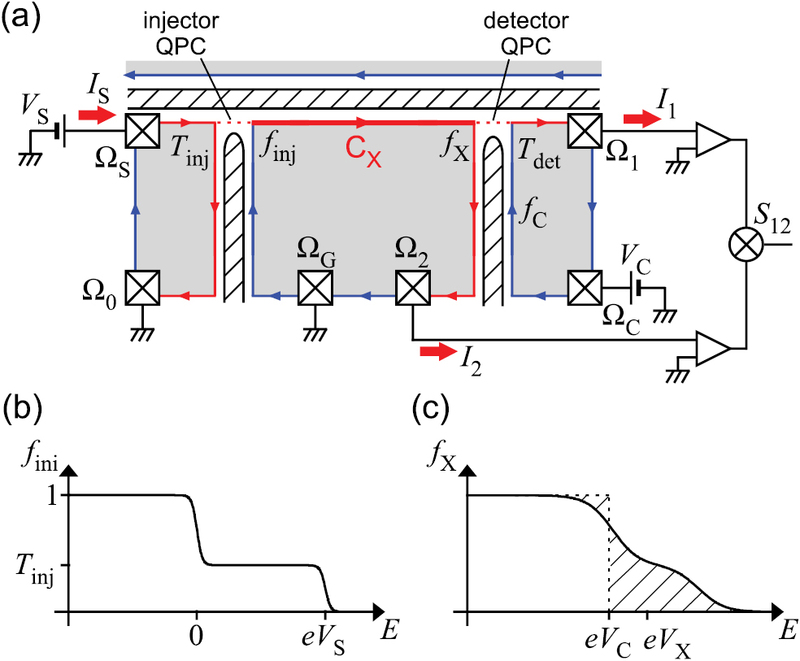 An initial non-equilibrium state is prepared with the injector QPC and its state after traveling through an edge channel is investigated by the detector QPC. The model calculation suggests that the energy distribution function of electrons can be obtained by measuring the noise for various chemical potential eVC of the reference input for the detector QPC. We have applied this scheme to investigate a single-mode edge channel with bulk filling factor ν=1. In contrast to naive expectation of coherent and elastic transport, we find significant relaxation in the channel. This unexpected behavior implies the presence of long-range Coulomb interaction, or of something else altogether. This encourages us to study current noise as a possible probe of many-body effects in electronic transport. Tomoaki Ota is a PhD student at Tokyo Institute of Technology, studying relaxation phenomena of quantum Hall edge channels using transport measurement techniques. Masayuki Hashisaka is an Assistant Professor at Tokyo Institute of Technology. His research interest is quantum transport in semiconductors. Koji Muraki is a Senior Distinguished Scientist in NTT Basic Research Laboratories. His group studies quantum correlated phenomena in semiconductor nanostructures. Toshimasa Fujisawa is a Professor at Tokyo Institute of Technology. His team focuses on quantum transport and electron dynamics in nanostructures at low temperature.